Breakfast has to be simple, quick, and delicious, too. How does digging into sweet pancakes early in the morning sound? 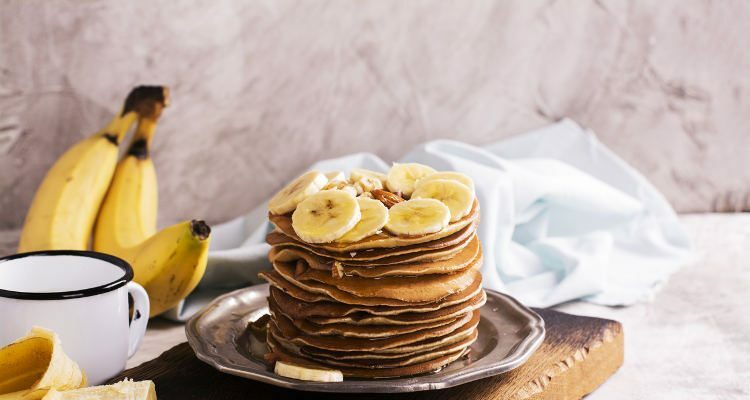 Here are 10 amazing banana pancake recipes you can make for breakfast. If you are vegan and wondering how to make vegan banana pancakes, you have come to the right place. Read on to explore these simple and scrumptious recipes. In a bowl mix flour, white sugar, baking powder and salt. In another bowl, mix egg, milk, vegetable oil, and bananas. Fold the flour mixture into the banana mixture. Heat a lightly oiled frying pan or griddle over medium high heat. Pour 1/4 cup of the batter onto the griddle, for each pancake. Cook until pancakes are golden brown on both sides. Fluffy banana pancakes are ready to serve. Mash the banana with a fork to puree it. Add in the eggs, baking powder, and vanilla and mix. Heat a frying pan and lightly grease it. Pour the batter on the pan to make pancakes. Cook for one to two minutes on each side, and then remove on a plate. Top the pancakes with the pecans and raspberries. Combine the plain flour, baking powder and milk with the egg yolks and mix until it forms a thick batter. Whisk the whites with the salt until they form stiff peaks. Gradually fold the whites into the batter. Heat a non-stick frying pan and grease it with oil. Pour the batter on the pan to make pancakes. Melt the butter and sugar in a separate pan over a low heat until they form a caramel sauce. Peel the bananas and cut them in long strips. Fry them on the pan until they turn golden. Serve them on the pancakes topped with a good spoonful of crème fraîche. Keep two tablespoons of butter aside, and put the remaining in a sauce pan and melt it over medium heat. In a bowl, combine the flour, sugar, baking powder, and salt and mix gently. Mash the banana and add the milk, eggs, and vanilla and stir with the fork until well blended. Pour the banana mixture and the melted butter into the flour mixture. Add chopped walnuts. Mix gently until blended. Heat a greased griddle over medium heat and drop the batter on it. Cook until the pancake turn golden brown and then flip over to cook from the other side. Remove the pancakes onto a plate. Serve while still hot with maple syrup and sliced bananas. In large bowl sift flour, sugar, salt, baking soda and baking powder. In another bowl whisk egg, buttermilk, milk and melted butter. Fold in the flour mix with the egg mixture. Melt 1/2 tablespoon butter on the pan and drop 1/4 cup of batter on it for each pancake. Immediately press four to five banana slices on each pancake so that batter covers them from the top, too. Cook for about three minutes or until golden. Serve hot with syrup. Preheat oven to 175°F. Whisk together flour, sugar, baking powder, and salt in a bowl. In another bowl whisk egg, milk, and butter until combined and slightly lumpy. Heat a large nonstick skillet over medium heat and place five banana slices in the pan with some distance between each. Spoon one tablespoon batter over each and cook until large bubbles cover surface. Flip it and cook from other side. Saute extra banana slices in butter until golden. Serve with pancakes. Put the flour, salt, baking powder, and cinnamon powder in a bowl and set aside. Whisk the egg, milk, and banana together, in a separate bowl. Add in the brown sugar and yogurt and mix to avoid lumps. Whisk in the vanilla until combined. Make a well in the dry ingredients and pour in the wet ingredients and stir until combined. Add the chocolate chips or fruit and mix gently. Heat a griddle or skillet over medium heat and coat it with oil or butter. Drop about 1/4 cup of batter on the griddle. Cook until bubbles appear on the center and side. Flip and cook for two minutes. Serve hot. You can even freeze the pancakes for up to two months. Mix the dry and wet ingredients separately in two bowls. Add the wet ingredients to the dry and mix it gently. Heat a large nonstick skillet or griddle over medium-high heat and ladle pancakes onto it. Place some banana slices on the pancakes and cook them until golden brown. You can also add some berries on it. Flip them over and cook again for a minute or two. Serve stacked high with plenty of maple syrup. Preheat the oven to 225°F. Melt 25 grams of the butter in a small pan over a low heat and then cool it. In a food processor put the melted butter, flour, baking powder, eggs, sugar and milk and blend until smooth. Pour the mixture into a large bowl and add the chopped banana to it. On a hot greased pan, drop the mixture to form pancakes and cook for three minutes, on both the sides. Make pancakes until all the batter is used. On the same pan add the streaky bacon and cook for about three minutes on each side until golden and crisp, turning once. Stack the pancakes and top with the fried bacon. Drizzle little maple syrup on the stack. Spray or drizzle oil in a non-stick pan and heat it over medium heat. Pour in a small amount of the batter to make thick pancakes. Cover and cook on one side. Flip the side and cook until golden. Addean, “Banana Pancakes I,” Allrecipes web site; http://allrecipes.com/recipe/20334/banana-pancakes-i/, last accessed January 11, 2017. Godwin, S., “Banana pancakes,” BBC Good Food web site; http://www.bbcgoodfood.com/recipes/banana-pancakes, last accessed January 11, 2017.